The SaaS tsunami has had profound impacts upon the software industry, and it isn’t over yet — especially for Support, where it’s just beginning. While traditional software vendors and their customer contact center teams desperately struggle to keep ahead of the expensive floods of “It’s Broken; Fix It NOW!” calls, Support in SaaS companies is different. A new era has begun; what was once a despised but necessary evil in the traditional software game is fast turning out to be the key to long-term corporate success in the new SaaS ecosystem. For Board members, CEOs and senior management teams of SaaS manufacturers and their partner organizations, it’s time for a conversation about redefining the role, profession and practice of Customer Support. 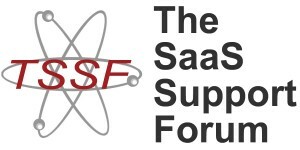 Facilitating and extending that conversation is the purpose of The SaaS Support Forum ™. TSSF is hosted by LinkedIn.com, and will be managed by a team led by Mikael Blaisdell, Publisher of The HotLine Magazine. While the main audience for The SaaS Support Forum are the members of SaaS company boards and senior management teams, the resource is open to all interested professionals. (A LinkedIn membership and profile is required in order to access the Forum or to post comments in it; there is no cost for the membership or for participation in the Forum.) All who post comments in the discussions are fully identified by name, company affiliation and title, which aids both civil discourse and credibility. Although the conversation will focus on Support in the SaaS community, there will be a lot of value therein for support professionals and senior management teams from traditional software manufacturers as well. As with The HotLine Magazine, the ongoing TSSF conversation will deal with the Strategy, Process, People and Technology of custerom retnetion and enhancing per-customer profitability through the redefinition of Customer Support. A link will be added to appropriate THL articles here on the Magazine site, enabling visitors to join in the discussion of the particular topic on TSSF. Topics on TSSF will often include links to THL articles and other resources. When appropriately managed, online discussion forums have proven to be popular and very useful resources since CompuServe forums became widely available in the early 1980’s. Keeping the discussion on-topic and the content well-managed are the keys to success for any forum, and TSSF’s administration team will work towards those goals. Questions about TSSF’s policies may be submitted through use of the Comment button below.